Compact sit on top kayak for younger and smaller paddler. Agile, stable, fun, and easy to learn describe the New Move. The New Move is designed for paddling in lakes and rivers, but when equipped with the optional thigh straps, it can also surf with style. 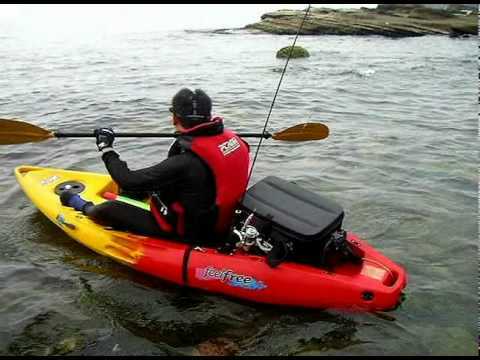 In addition, the New Move also provides space for rod holders to turn your Move into very comfortable fishing kayak. A versatile single person kayak, the Feelfree Move is a great place to start your paddling adventures. Designed for paddling in lakes and rivers, it can be equipped with optional thigh straps and used to surf with style. In addition, the Move also provides space for rod holders so it can easily be transformed into a comfortable fishing kayak. Combine its lightweight hull and our popular Wheel in the Keel moving the Move becomes easy for any solo paddler. Best choice as a "first kayak". Move is stable enough for beginners. Often choose as a recreational kayak for kayak rentals on beach or as a "summer house" kayak. Move is really compact kayak and will fit perfectly for younger and smaller paddlers.